Welcome to the fascinating tourist attraction in Malaysia, Underwater World Langkawi. The largest marine and fresh water aquaria in South East Asia, one must not miss the opportunity to experience walking through the tunnel displaying plenty of big fishes and sea creatures. First made its debut in August 1995, this attraction has attracted large number of locals as well as foreign tourists. The development of this underwater world has somehow further boost Langkawi’s tourism. This attraction was built to gear towards knowledge, education and entertainment. Therefore, the underwater world is not only suitable for leisure tourists but also families with kids. It was built with one aim – to raise awareness on the importance of preserving aquatic life forms and help human beings to understand the bond between man and nature. 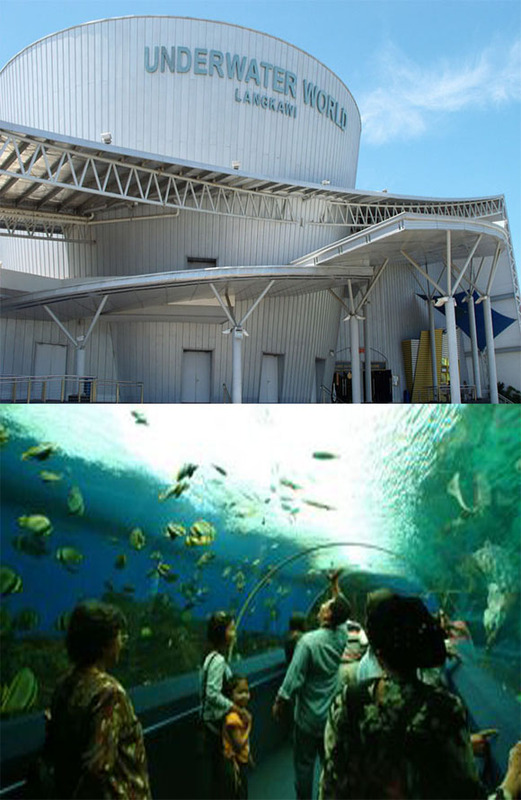 Featuring an enormous 15-meter long walk-through tunnel, visitors can see the unique sea creatures up close and personal such as Giant Green Turtle. Underwater World Langkawi is one of the largest marine and fresh water aquaria in South East Asia. Since the start of its operation on 26 August 1995, it has become one of the must visit tourist destinations in Langkawi and has attracted a large number of foreign as well as local tourists. Unique to Underwater World Langkawi is the gigantic 15-meter long walk-through tunnel consisting of 500,000 liter seawater which houses many big fishes and sea creatures including the Giant Green Turtle. Other attractions include the Freshwater Fish Section, the Seashell Display, the Koi Pond, the Mini Reptilian and Invertebrate Section, the Coral Reef Section and the Poisonous and Venomous Creatures Section. The 34,701 square foot oceanarium is located adjacent to a shopping centre and the Neptune Café. Visitors are thus provided with a one-stop shopping, eating and entertainment package, all of which are available within one area. Brace yourself for the poisonous and venomous creatures’ zone. Strategically located right next to the shopping centre and Neptune Café, once you are done touring the aquaria, walk over to the shopping mall to grab something to eat. You can pretty much get everything under one roof as the mall also houses entertainment package to accommodate tourists’ needs and demands. A new building with a concept of tropical rainforest and sub-Antarctic ecosystems, complete with 3D theatre that can accommodate 200 viewers at one time was opened and launched in 2005. A large variety of freshly cooked Malaysian and western food is served here daily. Quick snacks and hot and cold beverages are also available throughout the operational hours. The shop offers visitors a wide range of souvenir items at reasonable prices. Local dried foodstuff and delicacies made from fish and seafood are also on sale here. This section takes visitors through a journey to the heart of the Amazon River. Visitors will be able to see rainforest inhabitants such as the Anaconda and Marmoset.Among the tropical fish on display here are the Pacu, Knifefish, Temoleh, Giant Gouramy and various species of Arowanas.In addition, visitors can observe Mute Swans, Flamingos and the playful Mandarin ducks. Ground and flight birds flutter freely for observation in an environment close to their natural habitat. This section displays a comprehensive array of other freshwater fish and aquatic life from Southeast Asia, the Amazon, Africa and Australia such as the Bala Shark, and various species of Garfish, Catfish, Matamata and Stingray. Visitors will also be able to view a collection of exotic Turtles, Snapping Alligators, the Red–eared Slider and Albino Turtles. Arapaima, the largest freshwater fish can be seen in the preview tank. This section is made up of the Hexagonal Tank, Tunnel Tank and numerous smaller tanks housing various species of fish, invertebrates and crustaceans. Among the fish in the 70,000 litre Hexagonal Tank are the Black Tip and White Tip Shark.Venture into the deep sea along a 15-meter long tunnel, where you will experience being surrounded by Sharks, Giant Rays and Giant Grouper. Other tanks house the Sea Dragons, Lion fish, Giant Clam, Pufferfish, Sea Anemones, Hermit Crabs and more. This underwater garden with an explosion of delightful colours is part of the living treasures of the ocean’s delicate ecosystem. Giant Clams, Damsels, Wrasses and other types of coral provide visitors with a glimpse of the symbiotic relationship that exists among the inhabitants of the coral reefs. The Aquarium Education service offers a wide variety of programs suitable for children, as well as programs for higher education and professional teaching development. We have an extensive array of books, magazines and journals in our library for your reference. Researchers from local and overseas institutions of higher learning as well as members of conservation groups are welcome to conduct research on any of the exhibits. Of particular interest will be research on the breeding of the African Penguins housed in UWL. Underwater World provides practical training to undergraduates in zoology, botany, marine biology and related areas of study. During their period of training, the students will be able to interact closely with the marine, aquatic and wildlife by assisting UWL staff in caring for the exhibits. They are also encouraged to carry out their own research in the breeding, eating and living habits of the fish or other creatures of their choice. Underwater World Langkawi is located at Pantai Cenang, a popular beach to the south of Langkawi Island off the north western coast of Peninsular Malaysia. Visitors arriving by car will have to leave their car on the mainland and take the ferry from the Kuala Perlis Jetty, Kuala Kedah or the Penang Swettenham Pier, Penang. They can then proceed to UWL by car or taxi. Visitors can also fly direct from Kuala Lumpur International Airport or Penang International Airport to Langkawi and then on to UWL by car or taxi. Underwater World Langkawi (UWL) the largest aquarium in Malaysia houses a large collection of over 4000 aquatic lives. There are more than 500 species of animals and sea creatures in more than 100 specially designed tanks being exhibited here. Various animals, birds and inhabitants of the sub-Antarctic, Temperate and Tropical Rainforest regions are also on display here. More than 100 species of seashells from various parts of the world are grouped together in a unique display.The exhibits provide an opportunity for visitors and particularly nature lovers, to study and examine them in a comfortable and unique environment. UWL is also an educational centre where one can learn about the marine and aquatic lives and study their diet and breeding habits as well as observing them while at rest and play. In addition, one can also study the various inhabitants of the sub-Antarctic, Temperate and Tropical Rainforest that are on display. One can also gather information on other marine and wild lives via the interactive Information Kiosks, the 3D Theatre and the Wildlife Gallery. The concept and theme of UWL are geared towards Knowledge, Education and Entertainment. It is built to raise awareness on the importance of conserving our precious aquatic life forms, thus creating understanding of the deep and the inseparable bond between man and nature. The 40,000 sq. ft oceanarium is located adjacent to a shopping centre and the Neptune Café. Visitors are thus provided with a one-stop shopping, eating and entertainment package, all of which are available within one area. The ocenarium also incudes an underwater marine tunnel displaying large aquatic species such as Giant Grouper, Sharks, Giant Stingrays, Green Turtle etc. Can you provide some information on coral reefs? Many people mistakenly believe that coral reefs are made of rocks. In fact, coral reefs are made by millions of tiny animals called coral polyps. They have a soft, sac-like body with one end closed and the other opening at a mouth surrounded by tentacles with stinging cells. Each coral polyp secretes a hard, protective limestone skeleton. Over thousands of years, the accumulation of skeletal material forms a coral reef. The coral reefs thrive on the sea bed. They are so rich in animal life that they have been called the ‘rainforests of the sea’. A great variety of small colourful fish live around the reef as well as animals like nudibranchs (sea slugs), sea anemones, sea urchins and starfish. There are three types of reefs: fringe reefs, barrier reefs and atolls. To survive, corals need warm water, sunlight, and clear shallow water. Are sharks an endangered species? There are 380 species of sharks in the world. Several of these have been classified as endangered species by IUCN – the World Conservation Union, including the whale shark, basking shark, and great white shark. Sharks do not breed as fast as other fish. Hence, too much fishing reduces their numbers with millions being killed for their meat and fins. The other threats are drowning in gill nets, direct and incidental catch by commercial fishing, sport fishing, pollution, and habitat degradation. Many people think that all sharks are dangerous animals. However, only a few have been known to attack humans. The great white shark is the most dangerous and has been known to attack humans and fishing boats. This happens only when they are being provoked or sense some danger. No. Penguins, like all other birds, do not have teeth. The chicks do have an egg tooth, but this is not a real tooth, rather a sharp bump on the top surface of the bill which is used to break the egg when hatching. Penguins do have rearward-pointing, tooth-like barbs on the tongue and roof of the mouth. These are not used for chewing, but instead assist in the swallowing of their slippery prey. Most species have an average life expectancy of about 10 years, although some individuals occasionally live for up to 25 years. How deep can a penguin dive? The ability of a penguin to dive is related to its size – the bigger the penguin the longer it can hold its breath and the deeper it can dive. The Blue penguins (the smallest) can only manage 2 minutes and a maximum depth of 60m, while the Emperor penguins (the largest) can dive for up to 18 minutes and reach 550m in depth. The strategy of having a dark dorsal (upper) surface and a white ventral (lower) surface is one that has been adopted by many marine animals. Predators looking down see the penguin as a dark shape on a dark background and predators looking up see a light shape on a light background – the most effective camouflage for an animal that spends most of its time at or near the surface. Penguins store food in their stomach and it is regurgitated to the chicks. The adults do not feed each other and may stay ashore without feeding for many days. Pretty much in the same way that all other birds reproduce – the female is mounted by the male and sperm passes from cloaca to cloaca. The egg is fertilized at ovulation, but yolk development starts 14-17 days before this. After that the albumen (white) and shell are added and the egg moves down the oviduct. The whole process takes around 23 days. The second egg is laid after 3-4 days. No. Penguins use their wings (called flippers) to propel themselves through water rather than air. Because water is much denser than air, penguin wings are shorter and stouter than the wings of flying birds. Penguins are also much heavier than similar sized flying birds and have solid bones rather than weight-saving air-filled bones. While these characteristics enable penguins to efficiently “fly” through water, they have had to sacrifice the ability to fly in air to do so. Do penguins have feathers or fur? Like all other birds, penguins have feathers. Penguin feathers are short, overlapping and densely packed. The outer part of the feather is waterproof while the inner down section traps an insulating layer of air, keeping the penguin warm in the sometimes freezing water. Unlike those of flying birds, the feathers on a penguin’s wings are very short. Do all penguins live in the South Pole? Penguins actually live in the South Pole but two species do live on the edges of the Antarctic continent. The islands of the Antarctic and sub-Antarctic support the largest number of species. There are several species that live in temperate climates and one at the Equator (the Galapagos penguin). No penguins live in the northern hemisphere. The Emperor penguin is the only penguin that has to cope with extreme cold. Like all penguins, the Emperor has a thick layer of insulating feathers which are designed to keep them warm in the water, considering that heat loss in water is much greater than in air. In addition to this, the Emperor has the largest body mass of all penguins, which further reduces relative surface area and heat loss. They also are able to control blood flow to their extremities, reducing the amount of blood which gets cold, but still keeping the extremities from freezing. In the intense Antarctic winter, the male Emperor penguins (the females are at sea) huddle together to keep warm and rotate position to make sure everyone gets a turn at being on the cold edge. Getting cold is not really a problem for most penguin species; most have trouble staying cool when out of the water. Penguins often hold their flippers out to radiate heat and make their feathers stand up to flush out some of the warm air trapped within. Some species have bare patches of skin on the face with which to radiate heat, while others nest underground or in forests. The diet of penguins varies between species and in some cases, location. The diet includes a wide range of fish, squid, octopus and euphausids (shrimp-like animals). Some species of penguins, target surface – schooling fish species while others are mid-water or bottom feeders. Is photography allowed at UWL? Are there any charges? Yes you are allowed to take photos of our exhibits at no extra cost. However, most of the animals are sensitive to camera flashes so camera flash must be switched off. Discounts are given for MyCard and MyKid holders, Government Servants and University/College Students who produce their ID Card. Group discounts are also available for those who write in, including schools. Will I be allowed to feed the penguins/seals etc? No. To ensure the safety of the exhibits and the public, touching and feeding are not allowed except for the koi pond area. Furthermore, entering their surrounding will disturb their habitats. We do provide facilities for the disabled such as wheel chairs, elevator and ramps along walkways. Come and join us this Chinese New Year at Underwater World Langkawi (UWL). The first 100 visitors to UWL on 7th of February will be recieved with ‘angpow’ and mandarin oranges in conjunction with the Chinese New Year celebration. Lots of activities have been lined up for visitors to celebrate Chinese New Year at UWL. Don’t miss this opportunity to watch Lion Dance performance, by Hong Teik Lion Dance Group, Kuala Kedah. This group will perform the Lion dance at 3.30 pm in front of the UWL building. The public are invited to witness this mesmerising performance. Also not to be missed are our newly arrived sharks, the Zebra Sharks, Black Tip and White Tip Sharks. Come and watch our sharks during feeding time at 3.00pm daily and learn how our divers to get close to these ancient predators. Also see our South American Fur Seals performance with their new tricks, happening daily at 10.45 a.m., 2.30 p.m. and 4.00 p.m. Among the tricks are spinning in the water, jumping through hoops, waving to the crowd with their flippers, holding the buoy in their front flippers, saluting, shaking hand/flipper and high-jumping. In addition to the 500 species represented by 4,000 live exhibits currently on display, we have a new species, Jellyfish from the Philippines for viewing. This is part of Underwater World Langkawi’s continuous effort to provide a unique, memorable and educational experience to its visitors. Besides being an international tourist attraction, UWL has also paved the way to become a centre for research and development in the fields of zoology, botany, marine biology and related areas of study. 21st November 2007 – Underwater World Langkawi (UWL) is pleased to announce the arrival of its new species, in addition to the 500 species represented by 4,000 live exhibits currently on display. The new species is the Jellyfish from Philippines and is part of Underwater World Langkawi’s continuous effort to provide a unique, memorable and educational experience to its visitors. Jellyfish are marine invertebrates belonging to the Scyphozoa class of the phylum Cnidaria. They can be found in every ocean in the world and in some fresh waters. The use of the term “jellyfish” is actually a misnomer since scyphozoans are not fish but invertebrates. Although incorrect, the term is also commonly-applied to some close relatives of true scyphozoans, such as the Hydrozoa and the Cubozoa. UWL’s marine Jellyfish come in a variety of colours, shapes and sizes. The body of an adult jellyfish is made up of 94–98% water. It is made up of a translucent bell-like jelly which encloses its internal structure, from which tentacles are suspended. Each tentacle is covered with cells called cnidocytes that can sting or kill other animals. Most jellyfish use these cells to secure prey or for defense. Jellyfish feed on small protozoa, large metazoa and other small fish. They generally trap their food in their tentacles. They move horizontally with the water current and weather. The life span of a jelly fish is at most 3 to 6 months. Underwater World Langkawi is operating as usual and has reopened all its tanks with new and exciting species. We would like to highlight our newly hatched African Penguin Chick, which is the 12th chick, hatched from this species along with two (2) adorable Rockhopper Penguin Chicks that hatched in September 2007. Also not to be missed our South American Fur Seals performance with their new trick daily at 10.45 a.m., 2.30 p.m. and 4.00 p.m. Among the tricks are that performed by the seals are spinning in the water, jumping through hoops, waving to the crowd using its flippers, holding the buoy in their front flippers, saluting, shaking hand/flipper and high-jumping. Currently, they are being trained to play catch with a ball.